As a member you get a lot for your money! 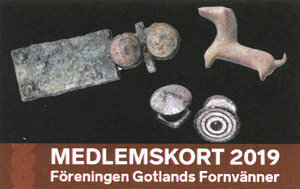 You get free entrance to Fornsalen, the Art Museum and our heritage farm sites. You also get the yearbook Gotländskt Arkiv (worth approx. 300 SEK), a discount on lectures, programmes and tours, and a 10% discount in our Museum shop, webshop and café. From 2017 we will take a postage fee if you want to have your membership book sent home by mail. The alternative is to collect the book at Fornsalen. The fee is 50 SEK for Sweden and 130 SEK for the rest of the EU. Click on the link below to pay your postage fee. When you are done shopping, logged in and have reached the checkout, write the name and address of the future member in comment space. If there are more than one surname, please mark the surname connected to the address. We will send you your membership card. The card shoukd have your name on it, since it is your personal membership certificate. When purchasing a membership through our webshop you get a membership discount on all other items in the same purchase. The membership price is not effected by the discount. The membership discount cannot be combined with other offers.